Antares 0.7x Focal Reducer 2"
This superb fully multi-coated double-focal reducer takes advantage of the latest computer aided design techniques to achieve the highest standards of performance to dramatically increase the field of view (FOV) or imaging scale of your telescope regardless of brand or type. Using the same superb optics from the f6.3 SCT reducer, the Antares 2 inch 0.7x focal reducer screws directly to the 2 inch filter threads found on eyepieces, camera nose-pieces, extension tubes, star diagonals etc. 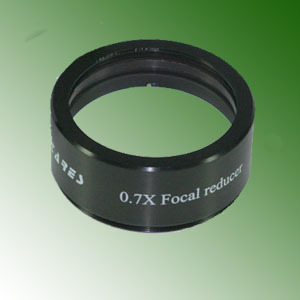 The sheer versatility and performance of this new focal reducer can not be over emphasized! It fits virtually every 2 inch accessory (with filter thread) and greatly reduces the focal length of any telescope it is used with (the exact effect of the reducer is dependent on its position). Antares 0.5x Focal Reducer 2"